One thing we ALL hate in this industry is last minute orders. We all get them, a client or a customer or a family member calls you a day or two before an event and expects you to make THEIR poor planning YOUR emergency. 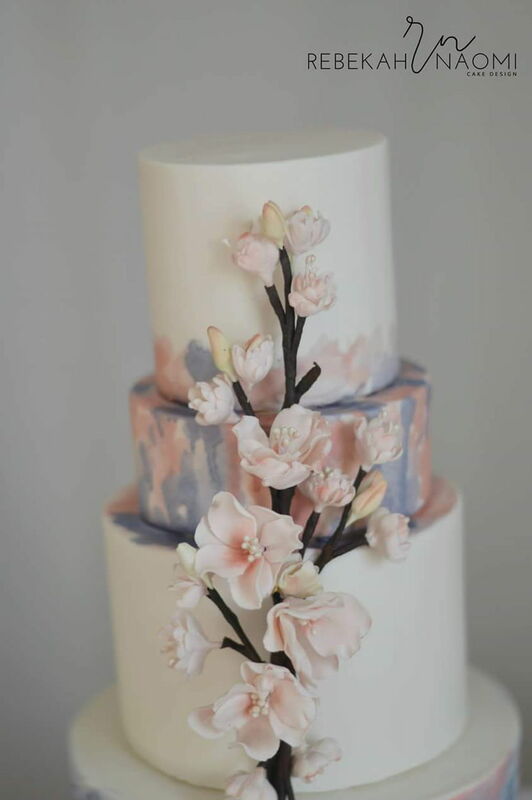 So when a friend of mine messaged me at 2:00pm on Monday requesting a cherry blossom wedding cake for the next day, my eyes rolled and my first thought was, "you're got to be kidding me!!" So, as you'd expect, I politely declined the order, however, after a little back and forth she told me that the cake was for a bride to be who had lost her fiance and that she (my friend) and some friends of the bride were planning on surprising her with a special gift..a little piece of the wedding of her dreams, the one she never got to have. They were going to photograph her, in DC, under the cherry blossoms, in a beautiful gown, with a beautiful bouquet and they wanted a cake (even just a tiny one) to make her day complete. There are few times that I am left speechless by requests from clients, but, this was definitely one of those times. Well, I sat there for a moment and then I looked around at my children playing and the photographs of my husband and I on our wedding day, displayed on our book shelves and it just about brought me to tears. How could anyone say no to such a request? So I agreed to make the cake, with less than 12 hours and, literally, no decorations made ahead. 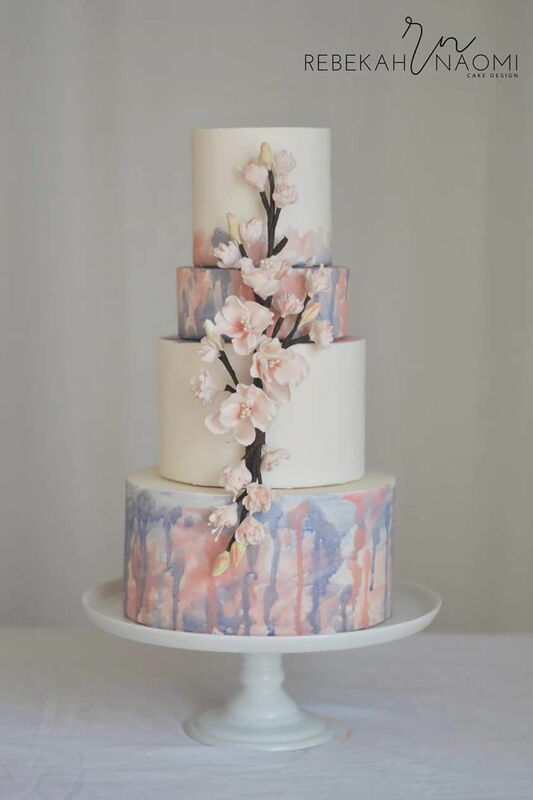 But, above that, I promised a cherry blossom wedding cake, not just any old cake, but a cake for THIS bride and come hell or high water, there would be a cherry blossom wedding cake by tomorrow. So I put the kids favorite movie on and maniacally began making cherry blossoms, praying they would dry in time; whilst simultaneously baking cakes. At 1:00 am, I hit the wall. I crashed. The cherry blossoms were made, even dried (somewhat) and assembled. The cakes were covered and stacked but it was missing something, it needed something. I remembered seeing a cake by Avalon Yarnes that featured this 'drippy' watercolor effect and I had a brainwave moment. I grabbed my blue and pink petal dusts and some lemon extract and got to painting. As I was dripping the paint onto the cake, it started to remind me of a watercolor painting of the DC cherry blossoms that had been left out in the rain, and slowly the colors had started to run and weep and bleed into one another; a poetic juxtaposition of beauty and sadness. This cake was a huge challenge, not just in the intense time constraints but in the emotional contradictions it represented. By 2:00 am, I was finished, the cake was boxed up and ready for pick-up. I even got to see the bride, and, without exchanging words, I could feel the immense love that her friends, who orchestrated this event, have for her and HER immense gratitude for their love. I can't imagine what a day like today must mean to her or what it represents. In Japan, cherry blossoms signify the beauty and fragility of life, they remind us that life is overwhelming beautiful but tragically short, I couldn't think of a more symbolically meaningful flower for this bride. I hope, like the flower, she gets to bloom again. You did a magnificent beautiful work! Bravo! your story touch me too. 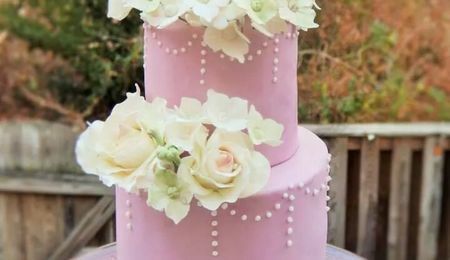 Your cake is relly beautifull and tender. Congrat to you. I think the bride will be OK. She must, with all her friends and good persons like you around her. very nice cake and nice story. 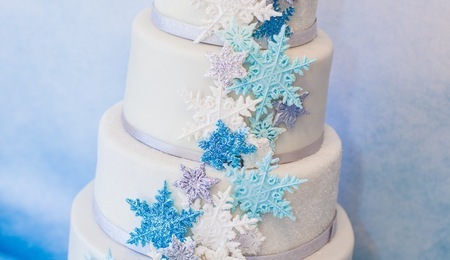 What an amazing cake! And the story touched me..
May I ask what is inside? What kind of cream? You just earned another star on your crown in heaven! She WILL love again and God has just the right person sitting in the wings for her. Unbelieveable the beauty you were able to create. This is one of the most beautiful cakes I have ever seen, you are not only an amazing artist but also a very caring person. God bless you! Wow! Such a beautiful story, cake and gesture!